Vermont is all about mountains, outdoor life and peaceful, beautiful surroundings. Upon arrival you will find it difficult to leave this one-of-a-kind four bedroom log home in paradise. It has all the ambiance you could wish for....warm and charming with spectacular views and large private spring-fed swimming pond with dock and raft for diving or sunbathing. This very comfortable, family and pet-friendly home has a large open floor plan with cathedral ceilings in both living room and dining room, massive two-sided stone fireplace, unique 12-person custom pine table in dining area, and spacious loft with additional TV/DVD for the kids. Enjoy mountain views from every room in the house including large picture windows in living, dining and master bedroom. This house comfortably sleeps a maximum of 8 people in four bedrooms. During the summer find yourself relaxing in our Adirondack chairs on the expansive lawn or large farmers porch overlooking the large serene spring-fed swimming pond, surrounded by beautiful landscaped gardens, spectacular mountain views and sunsets. Also enjoy star-gazing at night in front of a toasty-warm fire-pit. Gaze into the sky and you will see soaring gliders from nearby Stowe airport, hot air balloons or migrating Canadian geese. In winter, step outside with your snowshoes or cross-country skis onto local trails or enjoy watching your children playing or sledding in the snow. And of course, you can also enjoy some of the best skiing in the East just 20 minutes away at the Mt. Mansfield ski resort, 35 minutes to Smugglers Notch, 45 minutes to Jay Peak and 55 minutes to Sugarbush. Take a short drive into Stowe Village and indulge yourself in shopping, fine dining and world-class spa facilities. Or travel up the Mountain Road to visit Mt. Mansfield and the new $400 million resort at Spruce Speak at Stowe and experience the new hotel, spa, restaurants and shops, base lodge, 18-hole golf course, and much more. Also visit the newest exciting addition to the community, the recently opened Performing Arts Center at Spruce Peak . In the summer, enjoy many local activities such as the Hot Air Balloon Festival in July, summer concerts, antique car shows and farmer's market. The area also includes nearby well-known breweries such as The Alchemist (home of the famous Heady Topper), Rock Art Brewery and Lost Nation Brewery. We know that your stay here will be fun, relaxing and memorable for your entire family and friends and you will want to return again to this lovely property in paradise. My husband Peter and I grew up in Beverly, Massachusetts. He has always had roots in Vermont, since he and most of his family were born in the Stowe area. In fact his father was on the original crew that built and operated the first ski trails and lifts at Mt. Mansfield. Peter spent many summers and winters in Vermont as a child and eventually became a professional free-style skier in the 70's. Because of his love for Vermont and family connection, he built our wonderful log home on this beautiful property with breath-taking views. I also had moved to Warren, Vermont in the late 70's where I owned a home with a beautiful horse farm for 15 years. Coincidentally, after many years Peter and I re-met in Stowe during a weekend visit. I later relocated to Massachusetts, and we eventually married with a lovely outdoor wedding at our Vermont home. Needless to say, Vermont still has a special meaning to the both of us, and we are always reminded of how romantic the area is and how we fell in love every time we are there! Large two-sides wood-burning slate fireplace in living room and kitchen/dining room. Spices, sugar, oil and vinegars, etc. I've rented a lot of properties through vrbo an this was my favorite home I've ever rented by far. The views were breath taken , the home cozy an warm , an very very spacious for a family of 4 . We went skiing at both smuggs an stowe an they both were a very easy trip to both mountains. Also not a bad drive to mountain road in stowe to go out to eat with your family. We definitely will be back. Absolutely loved it. We are two older ladies who booked the country log home seeking a break from our busy routine. And what a break! We really had a sense of getting away from it all! The ambiance in the house and environs couldn't have been more restorative -- every detail delightful, every comfort provided for, from top-quality beds and linens to cheery skylight in the living room. Jacob (black lab) joined in our enthusiasm, grateful that the frogs shared their pond with him. We found the surrounding area to be full of every type of activity and attraction one could imagine. Scenic drives were our favorite, in the height of the fall colors. 100% positive - our highest recommendation! Clean and well taken care of property. It is about 20 minutes from Stowe Village and an hour to Montpelier or Burlington. Ideal spot to get away but within proximity to take day trips to other locations. Grill, fire pit, and lots of land at house. My family and I spent 5 days at this lovely property in July. We had 6 adults and a yorkie in our group. The house is very spacious and well maintained. It has great gathering areas but we also had plenty of privacy with 2 bedrooms and a bathroom on both floors. The kitchen is well equipped and the custom dining table is beautifully made and huge! We enjoyed several meals there. As nice as the house was we spent most of of our time outdoors. The grounds are just amazing. There are gardens and a back porch to relax with a cup of tea, or a glass of wine and admire the spectacular mountain views. We had a lot of fun in the private pond. We swam, floated,(there are tubes in basement you can use) and had frog finding contests. Turtles too. My husband even took me on a sunset cruise around the pond in the canoe. There is also an outdoor firepit which was great for making s'mores and star gazing at night. There are plenty of things to do in the area and plenty of restaurants. Visit the nearby tucked away waterfall. Our family has been to Vermont several times and this was exactly what we were looking for. A peaceful relaxing retreat. Thank you Sandy and Peter. A group of friends and I rented the Farmer’s home a few years ago and had an amazing time. 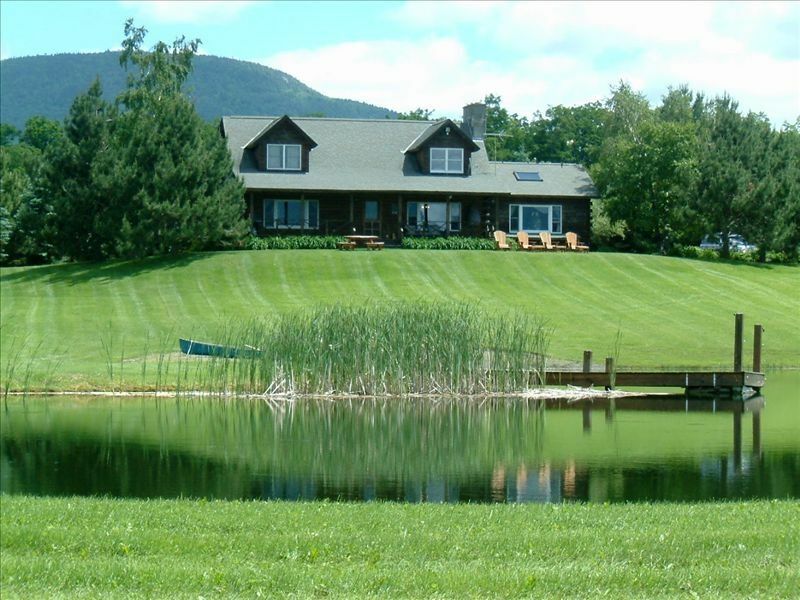 The house is well equipt and close to the Stowe Ski Resort. We have been going to Stowe every year since but were not able to rent this home. We were so excited to stay here for winter break again. The house was as cozy as we remembered it and the owners were very attentive to our needs. 3% Credit Card Administrative Fee shall be added upon booking reservation. DISCOUNTS OFFERED FOR LAST MINUTE BOOKINGS WITHIN 2 WEEKS!